Writers Google some weird stuff. Get over it. The beginning sequence to TV's Castle states that there are only two types of people who sit around plotting ways to kill people- serial killers and mystery writers (and he's the kind who pays better, haha)... so you can see why I might hesitate to google things like identity theft and kidnapping even if it is strictly relevant to the story I am writing right now!!! It is a post 9/11 world, after all!!! Until I can think up what I would say to the boys and girls in blue when they turn up searching my house for other people's children, here are some other things I have been searching for the on the Interwebz. * A look at Perth in the 1960s. * This video was recommended to me by a publishing rep who came into a bookstore I was working in. 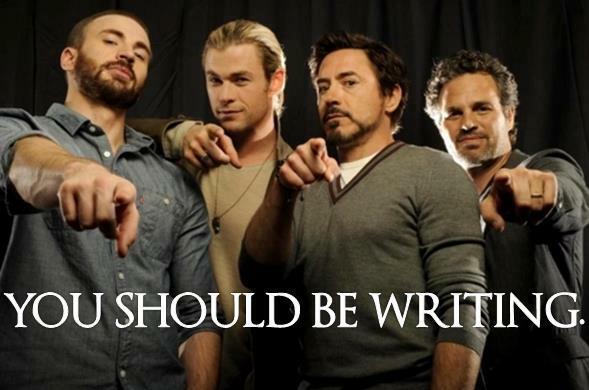 Pay particular attention to her advice for writers at the end! * Jess and I spent some time checking this out on the weekend. What do you think? If your house was on fire, would you take your iPod? And by the way this is Jess's blog. * What would famous authors have texted whilst drunk had there been mobile phones in their times? Find out here. 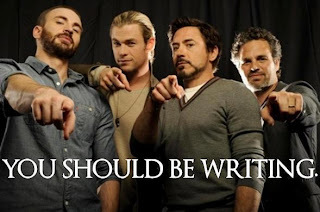 If Chris Evans, Chris Hemsworth, Robert Downey Jr and Mark Ruffallo tell you to write, you write!